We’d love your help. Let us know what’s wrong with this preview of HEINZ NOONAN AND THE MATTER OF THE VANISHING GREYHOUND by Steven Levi. To ask other readers questions about HEINZ NOONAN AND THE MATTER OF THE VANISHING GREYHOUND, please sign up. The author creates an impressive quest in the mind of the reader to unravel the shocking mystery behind the vanishing act of a Greyhound bus- part of a 10 million dollar heist. How could the bus occupied with 4 robbers and hostages totaling 12 on board all of a sudden vanish from a bridge while simultaneously being chased by the police both on road and on air? Here enters Captain Heinz Noonan- the quintessential detective with a repertoire similar to the Sherlock Holmes. 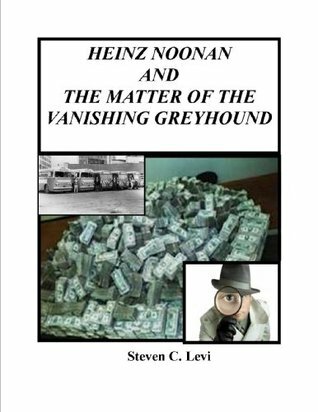 He is going to make histo The author creates an impressive quest in the mind of the reader to unravel the shocking mystery behind the vanishing act of a Greyhound bus- part of a 10 million dollar heist. How could the bus occupied with 4 robbers and hostages totaling 12 on board all of a sudden vanish from a bridge while simultaneously being chased by the police both on road and on air? Here enters Captain Heinz Noonan- the quintessential detective with a repertoire similar to the Sherlock Holmes. He is going to make history and add a bright feather in his cap if he manages to solve this case. As he probes further it doesn't seem a traditional robbery as the criminals are not the ones on the run but are all around him tracking his every move!